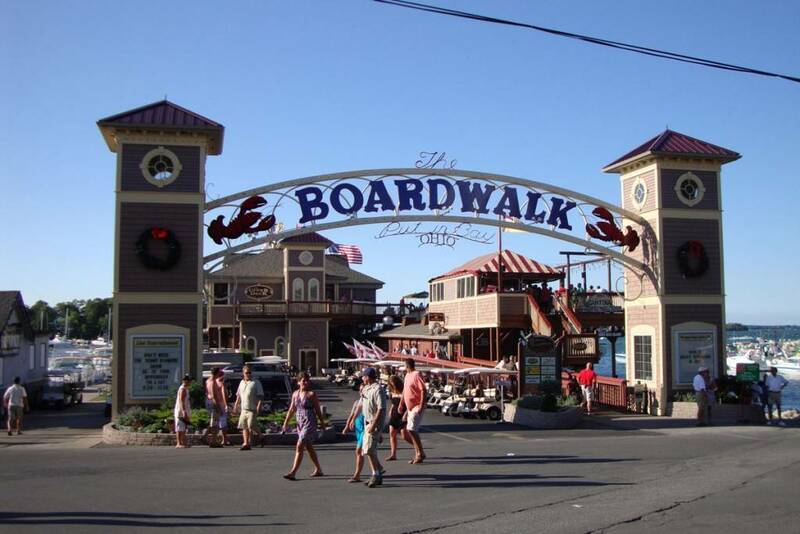 The Boardwalk Restaurant has many tasty Put-in-Bay dining options. Within the complex, there are a variety of food offerings. Most notably, is their Lobster Bisque. This restaurant is hailed as the Lobster Bisque Capital of Ohio. The Boardwalk has something for everyone. The waterfront location affords guests with expansive views of Lake Erie and the downtown docks. Additionally, sweeping vistas of downtown Put-in-Bay are sure to inspire. This building on the shore is very distinguishable. Boardwalk Restaurant- Dining Choices Galore! The Boardwalk Restaurant is comprised of several different eateries. On the main deck there are three distinct eateries. First, the Fish Shack offers some of best fish of Lake Erie. Fresh walleye and perch sandwiches are highlights. Second, the Little Galley is a budget friendly option. Families flock to this eatery for delicious burgers, hot dogs and more. Lastly, Book’s Seafood offers a variety of exceptional seafood offerings. Alaskan King Crab, Maine Lobster and Key West Pink Shrimp are a few of the notable menu items. Additionally, there are two bars on the Main Deck. The Burgee Bar and Claw Daddy’s await the thirsty traveler. The dining options do not end on the Main Deck. Step up to the Upper Deck for a served sit down meal. Furthermore, take in the panoramic views from the floor to ceiling windows. The famous Lobster Bisque is available here. Additionally, Boardwalk chefs create lunch and dinner specials. The menu features a variety of fresh seafood options, choice steaks and so much more. So, diners can expect to leave full and satisfied. The Boardwalk Restaurant on Put-in-Bay is not to be missed. Moreover, the legendary Lobster Bisque is worthy of a visit. Additionally, the Bisque is available at their sister restaurant, Hooligan’s Irish Pub. Still, there are so many tasty options that one trip is not enough. Let your taste buds sail right in for a meal you won’t forget.